If your organization is currently running either Microsoft Windows Server 2003 or Exchange 2003 on any servers in your office, you need to know about a dangerous security threat to your organization that must be addressed very soon. Please take a moment to read this important announcement. As your local Microsoft Partner, we are aggressively reaching out to all local businesses that use Server 2003 to alert you to this serious security risk to your organization and inform you about what you need to do now to protect your company. Microsoft has officially announced that it will retire all support on the Server 2003 operating system on July 14, 2015. That means any business with this operating system still running will be completely exposed to serious hacker attacks aimed at taking control of your network, stealing data, crashing your system and inflicting a host of other business-crippling problems you do NOT want to have to deal with. This is such a serious threat that the US Department Of Homeland Security has issued an official warning to all companies still running this operating system because firewalls and antivirus software will NOT be sufficient to completely protect your business from malicious attacks or data exfiltration. Running Server 2003 will also put many organizations out of compliance. Unless you don’t care about cybercriminals running rampant in your company’s computer network, you MUST upgrade any equipment running this software. At no cost, we’ll come to your office and conduct a full analysis of your network to help you determine what specific servers will be affected by this announcement. Additionally, we will provide a detailed analysis of all upgrade options available to you, along with the pros and cons of each option. While there, we will also assess other security, backup and efficiency factors that could be costing you in productivity and hard dollars. 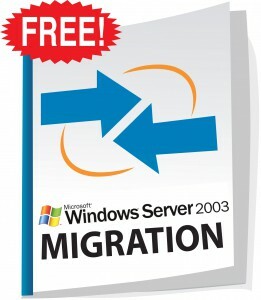 We will then put together a customized Server 2003 Migration Plan specifically for your office. Important: Due to the intensive one-on-one time required to conduct these Risk Assessments, we can only make them available for free until April 30, 2015, or until we receive 15 requests, whichever comes first. Please contact us today.